I'm sure most of you have seen, or at least heard of Emergency Alert System broadcasts. It's a system used to send alerts over TV, radio, and other forms of communication for things like tornado warnings, presidential messages, or most of the time, just tests to make sure the system is running when the time is needed. I got bored today, and after watching a mock EAS broadcast that admittedly creeped me the heck out at first, I decided to make a little app so I could generate my own. Anyways, this program allows you to generate realistic looking EAS broadcasts. 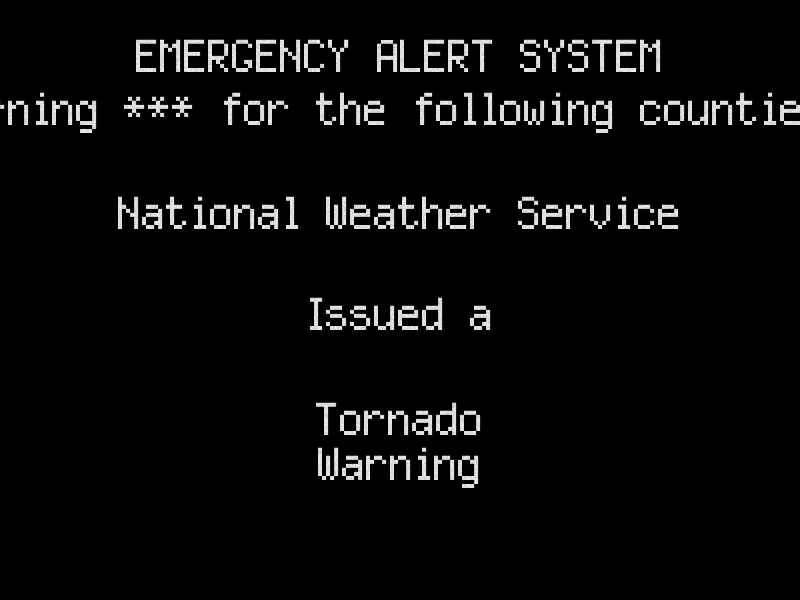 You can type in the name of the threat (Default is Tornado), type of threat (Default is Warning), group that issued the alert (Default is National Weather Service), and the message that scrolls along. This is not to be used as an actual broadcasting tool, and it is just for fun. I am not responsible for anything that results from you using this program. Made a tiny update to it, increasing the font size/window to match the swf file in my post. Also made a new banner. Hah, good for pranks I guess! But why is it 5 MB? It seems rather large. The EAS tone and static sounds. Sadly, there's no text to speech built in. That''s what I'm really looking for. I guess I'll just have to pair a TTS with the sounds in post. This topic is nearly 5 years old and TDWP FTW hasn't been active since September 2012; please don't grave-dig topics.